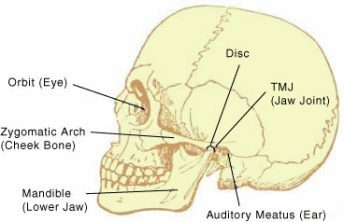 The ‘temporomandibular joint’ (TMJ) or commonly known as the ‘jaw joint’, is where the lower jaw connects to the base of the skull. The position of this joint is just in front of your ears and it can be felt by opening and closing your jaw while gently pressing this position. The number of patients presenting to their dentist with TMD are becoming more and more common. Diagnosis of TMD can be difficult due to its numerous causes and symptoms. A systematic approach must be performed by your FirstBite dentist to rule out all possible causes before treatment can be commenced. Your dentist will normally coordinate with other healthcare professionals to prepare a treatment plan so that all aspects of the problem, being physical and/or emotional are dealt with. Patients will be referred to a general medical practioner to exclude it being a medical problem if it does not appear to be a dental problem. If symptoms are acute (very painful or can’t open jaw), these will be dealt with immediately using medication, an occlusal splint (see below), and/or physiotherapy. After dealing with the acute symptoms the patient is then treated as a chronic (long-term, non-severe) sufferers. The following steps are usually followed, dealing with the simplest issues first and excluding them as possible causes of the problem. An occlusal splint is a hard piece of plastic that is made from a mould of your teeth. It is worn mainly at night times but acute sufferers may have to wear it 24 hours a day until symptoms are relieved. The purpose of the splint is to keep your teeth apart. In this position the facial muscles are most relaxed and less tension can be generated than when the teeth are together. The jaw joint is also free to move instead of being locked in place with constant muscle tension when the teeth are together. Acute sufferers are recommended to eat with their splint in place until symptoms are relieved. Non-acute sufferers are advised of the problems associated with chewing gum and hard diets (eg. nuts, bones), and it is recommended that hard foods are temporarily removed from the diet. Your FirstBite dentist can give you exercises to help relax your jaw muscles. Somebody who is trained in massaging the area can offer great muscular relief. Some medical specialists believe that muscular tension in other areas of your body (eg. back) can be the cause of your TMD problem, so a complete body assessment is highly recommended. There are many possibilities in our modern medical world to help relieve stress, such as yoga, naturopathic remedies and counselling. Sometimes the patient must try several options until they find one that suits them. Dentists in Australia have been allowed to use this for TMD for many years now with excellent results. Dr Hymer is one of Australia’s leading lecturers on the topic, guiding hundreds of dentists on how to use it and where it is appropriate. This is normally the last option and is only recommended once all other possibilities have been exhausted. If you would like to learn more you can watch these videos. Possible causes of TMD and pain related symptoms. Diagnosing TMD/TMJ and looking for treatments. Do you suffer from sleep apnoea? This may be the video for you.